To be honest, I'm not a big reader of debut works. 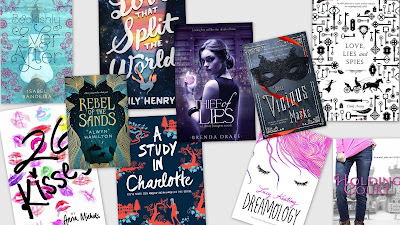 There are so many books on my TBR that by the time I have made some progress in trimming down my list, the previously debut authors have already released their sophomore (or higher) works. But I'm excited to try out more authors and after visiting Goodreads, I was surprised to discover that there are a lot of debut works that I am really excited to get my hands on next year. This new adult novel sounds like it runs in the same vein as the works of Kasie West and Sarah Dessen. Freshly broken off with her boyfriend, Veda is determined to move on and forget about Mark. What better way to do that than to spend an entire summer kissing boys - 26 boys, each with a name that starts with a different letter of the alphabet? This premise looks really interesting and I think if I'm in the mood for a chick lit, I would be happy to grab this one up and give it a go. I must admit, it was the cover of the novel that drew me in. This turns out to be a historical fiction with a heroine who's more interested in scientific research than the marriage mart and a hero who needs to focus on his spy mission and not eligible young ladies. A deal of convenience was struck and (I hope), chaos and romance ensues! The summary hooked me in. I know there may be books out there with similar premises but something about the way the blurb was written just drew me in. Over the summer, Natalie started seeing momentary glimpses of "wrong things" - wrong coloured doors, buildings in the wrong location etc. Then she was given the advice "you have three months to save him." That, plus the book title, just makes me excited to find out more. It wasn't until I read the book summary that I realized the title is a clever play on the famous work "A Study in Scarlet." Cavallaro's debut novel focuses on the great-great-granddaughter of Sherlock Holmes - Charlotte Holmes - as well as the great-great-grandson of John Watson - Jamie Watson - as their worlds collide and they become entangled in a murder mystery. Intriguing indeed. Another book whose cover drew me in. But then the premise of jumping into alternative worlds of libraries? I'm sold! This book gives me the same vibes as Fangirl which makes me really excited to pick this one up. Phoebe Martins, whose life is as ordinary as it can get, loves to immerse herself in the worlds of young adult fiction where dreams come true, the heroine meets her soulmate and everyone lives happily ever after. Nothing like that would ever happen to her, right? Then one day, she discovers there may be a guy who has a crush on her. All of a sudden, she has to turn to her beloved YA books for advice. This story has a contemporary young-adult mystery thriller premise going on, which sounds super intriguing. I'm tempted to find out more. The beginning premise of this story is reminiscent of the beginning of Untold by Sarah Rees Brennan (book 1 of the Lynburn Legacy) where the heroine knows the hero in her mind and then shockingly discover her imaginative boy actually exists in real life. However, that's probably where the similarities between the two stories end. I'm really excited to see where Dreamology takes this premise! A heroine desperate to escape the dead-end town she lives in. Check. A mysterious hero who suddenly whisks the heroine away on an adventure. Check. Mystical creatures that turn out to be real? Check. I want this book now. The book summary had me at "Jane Austen meets X-men." Enough said. So there you have it. 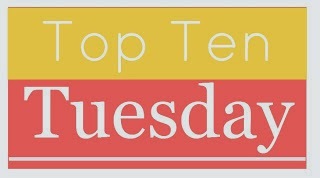 Those are the top ten 2016 debut novels that I'm excited to read. Let me know which books you are looking forward to! Oh nice! Curious about Thief of Lies as well! Thief of Lies sounds great - that one wasn't on my radar before but I'm adding it to my wish list now :o) I'm really excited about Rebel of the Sands and These Vicious Masks are both on my list too!